For those who love all things Bayern Munich, a trip to Allianz Arena is worthwhile even if the four-time European champions are not playing as the German powerhouses have opened a new museum called FC Bayern Erlebniswelt. Housed within Bayern’s home arena, more than 3,000 m² of trophies, worn jerseys, match balls, photos and images, boots and other memorabilia are waiting for fans at the “World of Experience”, which goes through Bayern Munich’s 112-year history. “I have to say: all the credit to those involved. This is sensational from A to Z, a milestone, and a gem in the Bayern collection,” said Bayern club president Uli Hoeneß of the exhibition, which includes 2,600 exhibits, 500 photos or images and 320 minutes of film. 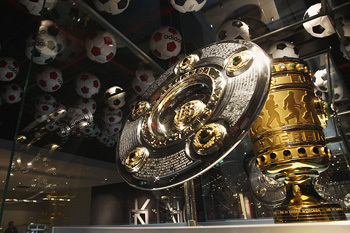 The doors of FC Bayern Erlebniswelt opened for the first time on Friday, May 25. “We wanted an impressive retelling of Bayern’s history in an entertaining way,” said club chairman Karl-Heinz Rummenigge. 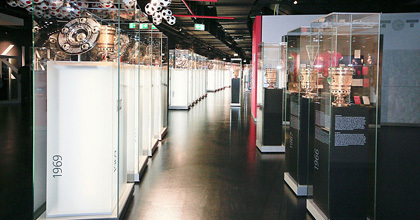 The heart and soul of the museum are the trophies with replicas of every major trophy won by the club including the Bundesliga championship shield, the DFB Cup, the Champions League/European Cup, European Cup Winners’ Cup and the UEFA Cup. Visitors will also encounter giant video screens showing historical footage, including from Bayern’s first German championship in 1932; the European Cup final in 1974; and Louis van Gaal’s memorable speech from the Munich town hall balcony in 2010. There is also a movie theatre showing an 11-minute film, which “explores the heart and soul of the club,” according to the Bayern website. There is a club Hall of Fame as well as a recreation of the boardroom at Bayern’s headquarters on Säbener Strasse where all the big decisions were discussed. Visitors even can take a seat on the FC Bayern team bus. In addition to a collection of Bayern jerseys from 1900 to present, a number of special exhibits are also on display including Giovanni Trapattoni’s tracksuit, Felix Magath’s lucky tie, Franz Beckenbauer’s shirt from the 1974 European Cup final against Atletico Madrid; Lothar Matthaus’ 1991 World Player of the Year trophy; the match ball from the 1967 Cup Winners’ Cup final against Rangers; and Ottmar Hitzfeld’s tactical notes from the 2001 Champions League final against Valencia. The oldest exhibits on display are a newsletter and trophy from 1902. And the newest exhibits are Philipp Lahm’s shirt from the Champions League final against Chelsea. Of course, Bayern fans may want to avoid looking at Lahm’s jersey as it may bring up those recent bad memories. Still those going through this exhibition will undoubtedly have enough good feelings about their club. After such a brutal defeat in the Champions League final, exactly the balsam for the soul the doctor called for.